Many of us cringe as the calendar slowly ticks towards April 15th. Tax season is a headache for most people in the best of circumstances and, unfortunately, a pending divorce sometimes only complicates matters. 1. What is my filing status? A divorce can make a simple question such as determining your proper filing status more complex than it needs to be. In the eyes of the IRS your filing status is determined at the end of the calendar year. This means that if your decree of dissolution was entered on December 31st or earlier you are deemed as single for the entire tax year, regardless of at what point in the proceeding year the decree was entered. 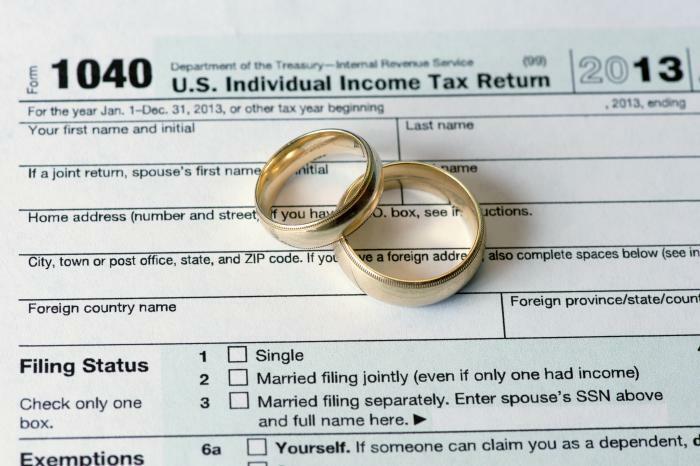 If you are still legally married at the end of the calendar year you have the choice of filing a joint tax return with your spouse or filing “married filing separately.” Under most circumstances a joint tax return provides you with the most advantages; however, be aware that you could be subject to joint liabilities based upon the actions of a spouse. Conversely, married filing separate may subject you to a higher tax rate but might help shield you from potential joint liabilities. It is best to discuss with a tax professional your specific situation to determine the best course of filing. If you are legally divorced at the end of the calendar year you must file as a single tax payer. Although you file single status you might be able to received credits / deductions as a result of the divorce that are discussed below. 2. What tax credits / exemptions may I claim? The most common income tax exemption is for support of a dependent child. Who claims this exemption is normally addressed through the court process. If an order of child support has been entered in your case it normally provides who gets to claim the exemption(s) each year. It is most common that any exemption is alternated between the parents. The IRS now requires the custodial (primary) parent to sign a release of the tax exemption in order for the other parent to use it. If you do no have a court order that addresses the tax exemption you will need to discuss your options with your attorney. If you are the custodial parent you also have additional credits that you may qualify for. Most notably are: childcare credit (for daycare), earned income credit (for low to moderate income households), and child tax credit (allows up to a $1,000 deduction from your tax obligation). Each of these credits applies in only specific circumstances and therefore it is advisable to discuss each one with a tax professional to determine if you qualify for these, or other credits or exemptions. 3. Can any portion of the money I pay in child support, maintenance, or attorney fees be deducted for income tax purposes? Although divorces can be expensive, the good news is that some of the cost might be deductible to you for tax purposes. For example, spousal maintenance (alimony) is often deductible to the spouse paying it and taxable income to the spouse receiving it. Likewise, if you were ordered to pay community debts, it is possible that some of these payments might be viewed as spousal maintenance and therefore be deductible for income tax purposes. Child support on the other hand is treated as tax neutral, meaning that it is not deductible income for the individual paying child support and is not taxable income for the individual receiving support. Likewise, unfortunately, attorney fees are almost never deductible for tax purposes. The only narrow exception to this rule is that sometimes attorney fees paid for collecting spousal maintenance owed may be deductible to you. Lastly, most property transfers between spouses during the course of divorce are non-taxable. For example, if you are awarded the family home per the divorce decree you will likely not have to pay any tax for the transfer of the home to you. However, be cautious that if you go to sell the family home after the divorce you potentially will be subject to capital gains at the reduced single filing status rate. 4. May I claim “Head of Household” on my tax filing? Determining whether or not you are eligible to claim head of household requires you to answer a few questions from the IRS. If you are single you qualify if: (1) you pay more than half the cost of keeping up a home during the last tax year, and (2) a child or other qualifying person lived with you in the home for more than 6 months. If you are married you qualify if: (1) you meet the criteria above; (2) you paid more than half the cost of keeping up your separate home during the last tax year; (3) your spouse did not live with you for the last 6 months of the tax year; (4) your home was the main home for your child or a dependent you have legal guardianship over for at least 6 months; and (5) you can legally claim the exemption for your child / dependent. This information is provided as general information and is not intended to address specific legal issues. The family law attorneys at Helland Law Group, PLLC have been serving Tacoma, Pierce County, Gig Harbor, Puyallup, Federal Way, Thurston County, and the surrounding areas since 1979. If you are going through a divorce, child custody, child support, parenting plan modification, or other complex family law proceedings please feel free to contact us for a free 30-minute consultation to discuss your particular case.